Cafe Breve, Caffe' Latte, Mocha, Cappuccino, Americano.... Coffee! This morning I was sipping fresh, hot coffee in my left hand while my right hand clicked through my recipe photos and files, deciding what to post today. It's early morning and not being a breakfast person, only coffee sounds good. 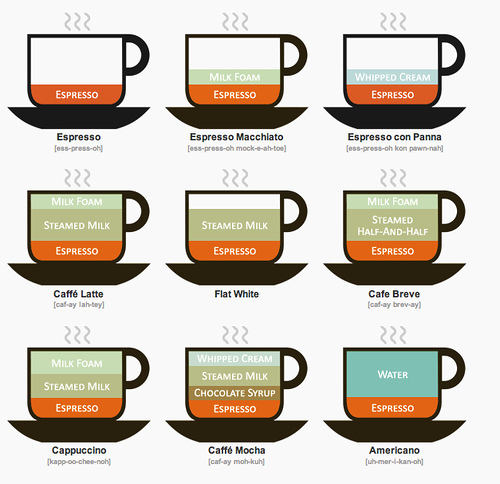 I saw this image that depicts the most popular coffee drinks, and easily shows how to make them using a graphic. I've had it in my files forever for personal use but never thought about posting it to my collection online. Why not? I have no idea! Silly me! This is an excellent guide to show you how to make the same very delicious drinks you are probably spending $5 on at the coffee shop each morning. So, I'm posting it now... and returning to my kitchen for another cup of fresh, hot, strong, black, coffee. As you know, we entertained house guests earlier this week. The day before they arrived I made a white Cream Cake but decided at the last minute to make it into a jello cake, as my father was visiting and it's one of his favorites. Little did I know that my father-in-law loved it even more! My Dad, my husband and I all had one slice and for the next three days my FIL had 2 slices a day. Suffice to say, he loved it. Bake a white cake of your choice in your size pan of choice - (homemade or store bought, doesn't matter). Use a skewer, a fork, a chop stick or some other thin, straight prong to punch holes all over the cake after you take it out of the oven. Mix the jello with a heaping cup of boiling water. Stir until dissolved. Drizzle the jello all over the cake, slowly and evenly. Refrigerate the cake for at least 2-3 hours. Whip heavy cream with sugar and vanilla to taste OR if you prefer, use store bought Cool Whip. Cover the cake. Chill until serving. So pretty and you can do this with cup cakes too! Readers who have popped in here a time or two over the last few months know that we just finished a relocation 1000 miles away to the deep South. Readers who have been around a little longer might know that this was move number 11 for us. From Los Angeles to Minneapolis, from Nashville to Birmingham and more than a few places in between, we've been blessed to have been able to relocate often and enjoy the awesome differences in the regions of this great country. One of the food items I've got a craving for happens to be from a tiny little dot of a town in Iowa. If you happen to be driving through the Midwest, be sure to stop by Jaarsma Bakery in Pella, Iowa and eat 2 or 3 Dutch Letters for me. No, really. If I had to choose between Cream Puffs with vanilla infused whipped heavy cream or the traditional flaky almond Dutch Letters... I'm not sure I could. I'll take both. Two of each actually. With fresh, hot, black coffee. And if you aren't traveling through Iowa (that's not Ohio and not Idaho... but Iowa), then perhaps you might want to jot down this recipe, like I did, so I can make them at home. Even though I know they won't be as fabulous as the ones made in Pella. But, then again, they've been doing this since they opened in 1898. They're pretty good at it by now. In a large bowl, whisk together flour and salt; add butter and toss until flour evenly coats butter. In a small bowl, mix 1 egg with 1 cup cold water and add to flour-butter mixture; stir to form a loose dough. Transfer dough to a floured work surface, and knead until dough comes together, about 10 strokes. Roll dough into a 15" x 10" rectangle. Fold up the 2 short sides of rectangle so they meet in middle, and then fold dough like a book. Rotate rectangle 90°; repeat rolling and folding technique. Wrap dough in plastic wrap and chill for 20 minutes. Uncover; and repeat rolling and folding technique twice more. Wrap dough with plastic wrap and chill 1 hour. Meanwhile, in a medium bowl, beat almond paste and 1 egg white on medium-high speed of a hand mixer until smooth. Add remaining egg white and the sugars, and beat until smooth, 1-2 minutes; set filling aside. In a small bowl, whisk together remaining egg and milk; set egg wash aside. Cut dough crosswise into 4 equal pieces. Transfer 1 dough piece to a lightly floured work surface, chilling remaining 3 pieces. Roll dough into a 12 ½" x 10" rectangle; cut rectangle into five 10" x 2 ½" strips. Working with one strip at a time, put 1 heaping tbsp. filling lengthwise down the center of the strip, using your fingers to spread it to each end. Using a pastry brush, brush egg wash down one edge and then, beginning with the dry side, roll strip over filling and into a cigar shape. 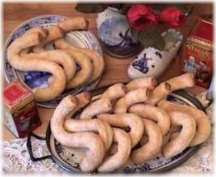 Transfer pastry rolls, seam side down, to a parchment paper-lined baking sheet and form into an "S" shape; repeat with remaining dough, filling. and egg wash.
Good Morning! 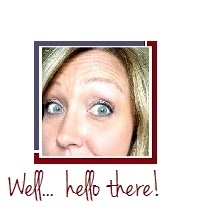 You are about to learn another little tidbit about me (whether you care or not, LOL.) I'm a closet Doris Day fan. My favorites might be Please Don't Eat the Daisies and The Thrill of it All! but I'd really be hard pressed to choose because I love most of them (there are a couple clinkers in there over the years that I don't care for). I didn't grow up watching these movies in our family home, so the first time I saw The Thrill of it All! was after I was already in my early twenties. It was the first time I realized anyone could make their own ketchup. And I wanted to make it. After that, I did start to garden, grew my own tomatoes and started to make and can my own ketchup, tomato juice and the best-ever Homemade Salsa. 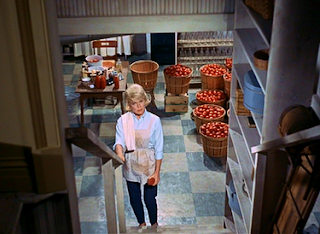 All thanks to Doris Day! Today's recipe is for Sugar Free Ketchup. I don't can this and I don't typically use my homegrown tomatoes. For this version, I make enough for one bottle at a time, use tomato paste and I keep it in a recycled ketchup bottle clearly marked "Sugar Free". Play with this recipe! After you make this, adjust the spices a little bit to what you like. Add a little more of this, a little bit less of that until you get the sweetness and spices to what you love. You may never go back to 'regular' store bought ketchup again. Whisk together. You can serve this or refrigerate it immediately or you can simmer it. If you have time, simmer in a saucepan over medium low heat at a low bubble for about 20 minutes. This thickens it and I think improves the flavors just a bit. But if you don't have time or don't want to, you don't have to simmer. Just put it in a mason jar with a lid or recycle a ketchup or other dressing bottle. This will make about 1 3/4 - 1 1/2 cups or so of ketchup depending on if you simmer it and how long as that tends to reduce it and thicken it a bit. The first night here I took the easy route and we grilled cheeseburgers and I made a simple Italian Pasta Salad. The second evening was a real Seafood Feast. It was so good! Steamed Crab Legs, amazing Crab Cakes, Butterfly Shrimp... and last night the only requirement was that the meal included my FIL's request; Potatoes. Any form. But he really loves potatoes. So made a Roasted Chicken and served with it Rosemary Thyme Potatoes, cheesy breadsticks, a fruit salad and I made some of the pan drippings into a simple gravy. It was a huge hit. This is not the actual chicken I made last night as I made up a hickory infused seasoning for the chicken but I had these photos from a previous meal I made the family which used the same cooking process to ensure an incredibly tender and flavorful chicken. Every time. Slice the lemon and onion in half and insert them into the poultry. Place the chicken in a crock pot or slow cooker. Season the top with your spices. If you like bland chicken, go easy. If you like flavor infused, then go a little heavier. There is no 'right' or 'wrong'. Play with it. Cook your chicken in the crock pot as long as you need to. By this I mean - if you are starting this at 8:am and won't need to serve it until 6:pm, then cook it on low for 10 hours. If you are starting it at 3:30 pm and need it by dinner, put it on high at 3 hours. The idea is that the chicken is going to do most of it's cooking in the crock pot. Transferring the chicken to a baking sheet or serving dish. The chicken is so tender at this point you have to handle it with kid gloves or it will fall apart. After trial and error, the easiest way I've found to transfer the chicken to a baking pan is to lay the baking pan over the crockpot (which now has no liquid left in it and is unplugged) and flip it quickly upside down so the chicken is now upside down on the baking sheet. Carefully use a large spatula to quickly turn the chicken over. If your chicken is quite that tender and can still hold its shape, you can use two large metal spatulas to lift and quickly transfer it to a baking sheet or pan for oven use. Now, either bake the chicken quickly at about 450 degrees to brown it or you can place it under a broiler in the oven for about 4 minutes. When the top is a beautiful brown and the skin has crisped up nicely, it's time to serve. Cook it and forget it. Leave it to cook... ignore it for a few hours. It's tender and flavorful but not pretty. So this is where you roast it or broil it to finish. When I need about 15 minutes before serving I'll bake it. If I'm ready for it now, I'll broil it for 4 minutes. The ethic foods our family grew up with include foods from traditional Sweden and Germany. And, although many ethnic foods have become a main staple in the USA over the past 30 years or so (Chinese, Thai, Indian, Mexican, Cuban all come to mind...) you are still hard pressed to find Lutfisk, Lefse and Brunkal at your local restaurant or fast food place. (In the case of Lutfisk, I have to admit, I prefer it that way... LOL). Over the years, I've come to like many Greek foods. Thankfully those have managed to find their way into American hearts as well. One of their pastries, you may have only had at a Greek Food Fair or perhaps at a Greek restaurant, but it's one you can easily make at home with ingredients you probably have on hand. It's a pastry called Koulourakia (sometimes spelled differently) - which is traditionally served as a twisted rope, sprinkled with sesame seeds. It's not sweet, which is probably why I like it. Cut the butter into the flour and mix with your fingers or two knives. Add baking powder. Beat the eggs with the sugar and add to the flour mixture with the vanilla. Knead thoroughly. Add more flour in small increments if the dough is too sticky. Grabbing a bit of dough about the size of a golf ball, roll out into strips about 3/4 inch wide, fold in half and give it two twists. Place on parchment lined baking sheet. Brush with beaten egg and sprinkle with sesame seeds before baking at 350 degree's for about 20 minutes. Cool. The sizzle of a steak hitting the iron grids of a hot grill is a beautiful sound. We plan to do a lot of grilling this weekend and next as we have two different groups of visitors coming and grilling out for dinner is not only easy and delicious, but makes conversation more simple. You can chat and laugh while standing over a grill much easier than trying to hold up your end of the conversation while running around your kitchen trying to read recipes, get things measured and mixed correctly and watching things in the oven, microwave and stove at the same time. Grilling is just... good. And here is a steak marinade to get you started. Mix all ingredients, whisk until blended and cover your favorite steaks with it. I find it easy to use a gallon sized Ziploc baggy - place 4 or 5 steaks in it, add the marinade, flip it over a couple times to cover the meat and refrigerate for at least 30 minutes, up to about 3-4 hours. Turn often to make sure the meat is marinated evenly. Grill as usual to your favorite level of 'done'. Marinate at least 30 minutes but no more than about 4 hours unless you like your marinade flavor strong in your meats. This is one of those recipes I keep in my proverbial back pocket to pull out on a busy day. I change it and adapt it in many ways from the dry seasoning I use, to whether or not I add onions, the kind of soup on hand, or even whether I serve it as a whole chicken breast or cut them up and serve it over noodles or pasta of some sort. So many options! I 'play with my food' and hope you do too. Lay the chicken in the crockpot and sprinkle on the dry dressing mix. Cover and cook on low 5-6 hours for 6 breasts, less for fewer pieces of course. About 45 minutes before serving, brown the onion in butter in a pan. Add the garlic, cream cheese, soup and broth. Stir smooth and add to the crockpot to cook for 45 minutes. Season with salt and pepper to taste. Cook all the ingredients in the crockpot at the same time except for the onion. Brown and add that at the end for flavor. This afternoon I was wondering what the oldest recipe I had uploaded to my files but had never posted was. 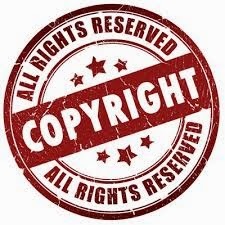 I made a deal with myself to post whatever recipe was still in 'draft' mode from the beginning of this blog. In the end, I broke that deal. It was Eggnog Cookies. And not too many people have extra eggnog left over that they are looking to use up right now. (If you do still have Eggnog in the refrigerator from Christmas, might I suggest you throw it out?). My next recipe in draft mode, never published was a form of gingerbread and then, a pumpkin pie. The first recipe that I could post from my 'oldest draft mode files' that was even slightly relevant to February, was gravy. And as a lover of gravy on everything from biscuits to bread to potatoes, stuffing and more... gravy is good to make any day of the year! Combine ingredients in a saucepan on the stove. Whisk while cooking over medium to medium-high heat. Bring mixture to boiling stirring frequently. Only boil for 1 minute before removing from heat. Let it stand for a few minutes to thicken a bit while you get the rest of the food on the table. Great on biscuits or mashed potatoes. I have two (2) recipes our family likes to use for homemade truffles. Using a good quality chocolate chip, both these truffles turn out so incredibly smooth, you would swear it was a Belgian Truffle. I don't really even care for chocolate, but when I make these, you can bet I end up enjoying them as well. I'll post this recipe here, and I guest posted the other one at SheSpeaks, so if you have found me from there, welcome! I'm so glad you stopped by! If you'd like to join the kitchen, check out the sidebar for following opportunities, Twitter, as well as email sign up to have posts sent directly to you. In a heavy saucepan melt 1 cup of the chocolate chips over low heat, stirring constantly. Stir in butter and whipping cream and liqueur if you are using it or extract. When smooth, refrigerate 15 minutes until thick enough to hold its shape. For years I have always made my alfredo sauce from scratch. I still do - but I've found during this most recent (crazy, hardest-yet to date of 11 of them) relocation to the new state, that having a jar on hand in the pantry has made it quick and easy to throw together a meal when the last thing on earth I had time to do at that moment was... throw together a meal. Ha ha. Starting with store bought stuffed, fresh ravioli that my daughter persuaded me to purchase, I was able to set the pasta cooking while I heated up the sauce, added some things to it, warmed up grilled chicken to go with and baked some french bread. Topped with some Smoked Gouda, it was very good and came together in minutes. Store bought items from the pantry made this quick and easy to 'doctor up'. Yes, I usually make it all from scratch (including the bread, the stuffed ravioli and the sauce) but even using bottled from the store is better than running to a drive through fast food. Boil the ravioli according to package directions. While the pasta is cooking, heat the oven and bake the french bread and heat the chicken strips. Pour the sauce into a saucepan on the stove and add about 1/2 - 3/4 c diced fresh red pepper (I usually add broccoli and mushrooms as well but didn't this night that I took photos). Warm the sauce. Grease and flour two 8-inch cake pans or one 9X13 since you are making cake balls and it won't be a layer cake in the end. Preheat oven to 350. Add the food color paste and vinegar to the butter/sugar mixture. Stir the vanilla into the buttermilk. Add the buttermilk alternately with the flour into the sugar/butter. Mix well. Divide batter between the two prepared pans. Bake 30 minutes or until done for the layer pans and 5-7 minutes more for a larger pan. Test for the center to be done. Remove from oven. Cool on wire rack 10 minutes, then remove cake layers from pan and cool completely. Turkey Avocado Sandwich on Sandwich Thins - Yum! For about two weeks, our family couldn't get enough avocados. Guacamole, sandwiches, halved with lime and salt sprinkled, wraps... we were all craving them. Why? I have no idea, but this is one of the sandwiches I made with them. Obviously you need to 'play with your food' and use what you have on hand or what you like, but if you make it the way did, you won't have any left over! Spread mayo thin on bottom and a thicker layer on top. Layer your sandwich, press together and serve! Good Morning dear readers! I've been busy painting the railing outside this morning but got a little too cold and came in to warm up and do some website updating. I decided to go through some of my old files and see what recipes I had hidden away when I spied this one. And... kind of laughed out loud. This is one I apparently copied down back in the Spring of 2008. I think I copied it down in my files as a 'what in the heck?' kind of recipe because although I think the ingredients are interesting, I have to admit that you would be hard pressed to ever find a can of Mountain Dew in my house, and our family has never really enjoyed 'dessert' recipes like this. They might eat cake, cupcakes, jello or some pies, but desserts like this one just don't fly in our household. So I'm happy to share it with all of you, but I admit it's one I've never tried. I have to say; if any of you try this (or have tried it) please share what you thought of it and how it turned out! Melt butter; add sugar and cinnamon. Unroll crescent rolls and place a peach quarter on each one. Roll from large end to small end of dough. Place into 9-by-13-inch baking dish. Pour butter mixture over rolls. Pour Mountain Dew over all. Bake at 350 degrees for 45 minutes. Serve warm with ice cream. Another year has passed already and it's time for my Annual Homemade Valentine's Day Cookies! I don't know much longer I'll be posting low carb recipes so grab them while you can! Actually, this is a food my regular readers will recognize. A variation on one of my favorite pizza's that I regularly make for our family that has been posted and pictured a number of times. Normally made with my homemade pizza crust, mayonnaise, garlic, feta cheese, onions and spinach but in order to cut the carbs down to a manageable amount I came up with this today for lunch. Using the Ole brand extreme wellness tortilla, it has 17 grams carbs, but 12 grams fiber so you are left with a total of 5 carbs. The other ingredients are less than 1 carb except the garlic. For that, add a carb. If you can afford just a couple more carbs, go ahead and add a few ripped up spinach leaves and onions and even a diced dried tomato. If you want to keep the carbs low, make the version I did. Mix the mayonnaise with the garlic and feta. Spread on a tortilla. 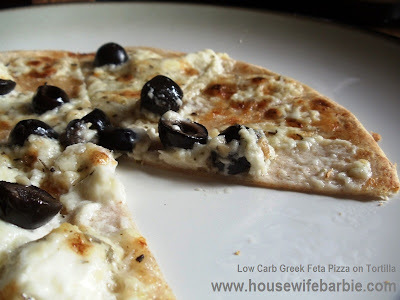 Sprinkle with oregano and top with black olives (or use Greek olives if you have them on hand. I don't). Place under the broiler of your oven for about 3 minutes until golden bubbly. Remove to a plate, cut like a pizza and serve. These are awesome appetizers too for a crowd - not necessarily watching carb intakes, but for anyone. Since I'm not an NFL football fan, I tend to forget there is a 'really big game' coming up. My husband, ironically IS a really big football fan and enjoys what our family calls "football food". In other words, foods that can be eaten with his fingers or with the help of a tortilla or other chip as he sits in front of the game. Since 2006 I've posted about a hundred appetizer or dip recipes that you could use, but for the heck of it, I waded through the ones I posted over the last year or so, and grabbed a few to post here to make it easy to glance through the list and see if there is something that looks good to you. If you want to dig a little deeper, feel free to use the labels for 'appetizers' on the right hand sidebar. At the end of the page just hit "older posts" for the next page. With the big football game parties this weekend, many people are looking for easy dip and appetizer recipes. I've posted a lot of these over the years, but this morning I was thinking that it had been a few years since I posted my favorite garlic pita chip recipe. You can find it here. However, this recipe below is perhaps a little easier for some people to whip up because it doesn't use fresh garlic, but instead, garlic powder - which many already have in their cupboards. If you fresh garlic, go ahead and try my original recipe. For quick and easy with what is in the cupboard, check this one out. GREAT with artichoke spinach dips! Preheat oven to 400 degrees. Cut each pita bread into 8 triangles. Place triangles on lined cookie sheet or baking stone. In a small bowl, combine the oil, garlic, salt, Brush each triangle with oil mixture. Bake for about 10 minutes, golden brown and crisp. Let cool. Here is a great dip recipe to go with it. Ohhh so good and healthy too. I love nutty pancakes. Pecans or almonds... yum. For low carbers on maintenance programs, add this one in! I had them twice last week with a delicious SF syrup. Hot and filling when you are tired of the 'same old thing'. Mix all ingredients In a greased skillet, spoon the batter into 3 pancakes. Cook until golden brown and little bubbles pop. Flip. Cook a minute more. Serve with butter and sugar free syrup.